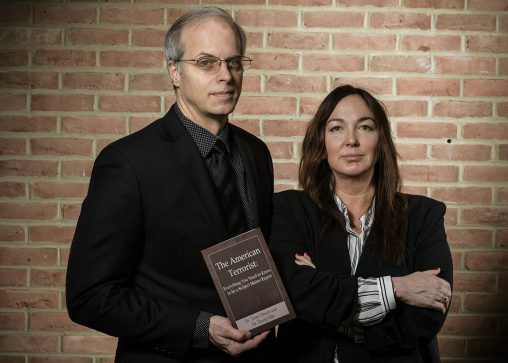 A four-year study on the common characteristics of American terrorists is the focus of a new book by nationally recognized terrorism expert Terry Oroszi and behavior researcher David Ellis, both of whom work in the Wright State University Boonshoft School of Medicine. Their newly released book, “The American Terrorist: Everything You Need to Know to be a Subject Matter Expert,” published by Greylander Press, offers insights to terrorism in the United States. Oroszi, assistant professor of pharmacology and toxicology, said she and Ellis wrote the book as an effort to halt the recruitment of American citizens by terror organizations as well as to identify the common traits of terrorists and the social circumstances that render a person susceptible to radicalization and prime them to commit acts of terrorism. According to the book, Ohio is ranked No. 5 in the country for terrorist residence and No. 2 for female terrorists. Two of the top 10 cities are Columbus and Cleveland. Oroszi said Americans have a greater chance of becoming a terrorist if they grow up without a father figure, if they reside in a geographic location different from the place they were raised, and if they have feelings of anger or of being a victim. Oroszi is the vice president of the Dayton InfraGuard, a partnership between the FBI and business, government and academic officials who work to address security threats to critical U.S. infrastructure. She was a speaker at a national InfraGuard conference in Dallas, preceded by former President George W. Bush and FBI Director Christopher Wray. Oroszi is also a graduate of the FBI Citizens Academy, which was created to provide leaders with an inside look at the FBI. The curriculum is similar to the traditional methods used at the FBI Academy in Quantico, Virginia, but is geared toward non-law enforcement participants. Last summer, Oroszi was selected to go to the FBI headquarters in Washington, D.C., the White House and the FBI training academy at the Marine Corps base in Quantico, where she received additional training and spoke with members from the Behavior Analysis Unit. Ellis was selected to attend the academy starting this spring. Oroszi has given numerous talks on terrorism both in the region and nationally and keeps a busy lecturing schedule. Earlier this month, she spoke at the Beavercreek Rotary; in April she hosted a talk and book signing at The Dayton Club; in May she will be a guest speaker for the Michigan InfraGard in Detroit; in June she is scheduled to be a speaker on terrorism at the National Homeland Security Conference in Phoenix; and in September she will speak at the GSX/Global Security Exchange in Chicago sponsored by ASIS International, an organization for security professionals. Oroszi also works to recruit college STEM students to the FBI, CIA and DHS. She hopes to work with her college dean to create a Department of Homeland Security Center of Excellence at Wright State focusing on health care and homeland security. Oroszi is working on a terrorism, social media and artificial intelligence project with Kno.e.sis, Wright State’s Ohio Center of Excellence in Knowledge-Enabled Computing. Oroszi and Ellis have also pulled together a team of experts to research active shooters and mass shooters, with members from backgrounds such as psychology, military, intelligence analysis, religious extremism and federal law enforcement. “We want to look at variables similar to the terrorist work, as well as others more fitting to the active shooter to identify similarities and differences to the terrorist profile,” she said. The mass shootings in March at two mosques in Christchurch, New Zealand, that left 50 people dead and dozens wounded hit close to home for Oroszi and Ellis. Olivia Stone, a contributor to the book, was affected when she walked to her car from her clinic, adjacent to one of the mosques, without knowing of the shootings taking place around her. Oroszi earned bachelor and master’s degrees in biology and her doctorate in organizational studies, all at Wright State. She serves as director of the graduate and CBRN Defense Programs. She is also founder and director of The Dayton Think Tank, a 50-member team of experts and community leaders formed to prepare the community and region for crisis events. Ellis earned a bachelor’s degree in toxicology from Ashland University and a master’s degree in pharmacology and toxicology and a Ph.D. in biomedical sciences, both from Wright State. Ellis conducts research in toxicology, neuro-behavior and human performance at the Air Force Research Laboratory. He is an adjunct professor in the Department of Pharmacology and Toxicology in the Wright State Boonshoft School of Medicine.